We love Mitsubishi, a car manufacturer led by engineers and cars built to an exacting standard. Sadly these qualities do not amount to big sales and they have fallen into the arms of the Nissan/Renault alliance where they will donate their PHEV and four wheel drive excellence and will receive engines and platforms in return. 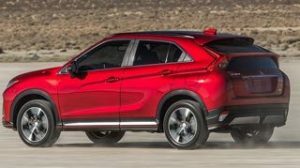 So the Eclipse Cross will be the last car Mitsubishi build alone. 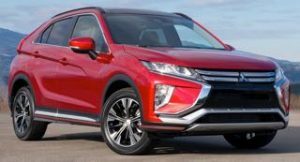 The Mitsubishi Eclipse Cross is an all-new small SUV that competes with the Peugeot 3008, Seat Ateca and Toyota C-HR. 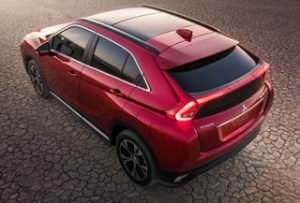 Mitsubishi already make two SUV’s, the ASX and the Outander, the Eclipse Cross is slightly larger than the ASX and slightly smaller than the platform sharing Outlander, if this seems strange it’s because the next generation ASX is to be smaller and the next Outlander to be larger, making a clearer differential within the stable. The Eclipse Cross is a five-seater only, although the rear seats can slide back and forth to change between extra legroom and more boot space, with the seats all the way back there’s 341 litres of space, but slide them forward all the way and it opens up to 448 litres. A Peugeot 3008 has 520 litres in the back all the time. The front is spacious enough, with a decent driving position and plenty of storage cubbies within easy reach. Visibility is good front and rear, although the split rear windscreen means there’s a solid line straight through your main mirror that could get distracting. The side mirrors are nice and big, though, which helps when you’re changing lanes on the motorway. 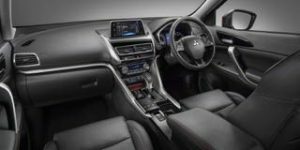 The Eclipse Cross comes in simple to comprehend trim Lines – ‘2’, ‘3’ and ‘4’, all cars have a seven-inch touchscreen display (Apple Carplay and Android Auto compatible) that sits on top of the dash like in a BMW. There’s also a trackpad controller on the centre console, but it’s easier to use the display itself to select the functions you need – and there are heater and air-con controls as physical buttons, unlike in the Peugeot 3008. ‘2’ trim also includes a rearview camera, keyless entry, automatic lights, auto high beam, auto wipers, cruise control, 16 inch alloy wheels and Privacy glass. Moving up to ‘3’ brings a Head-up display, front & rear parking sensors, 18 inch alloy wheels, heated front seats, electric, heated & folding mirrors and keyless operation. The top ‘4’ trim adds leather seats, powered driver’s seat, powered panoramic sunroof, LED headlamps, 360° parking camera, lane change assist, blind spot warning with rear cross traffic alert and automatic versions only have adaptive cruise control. The sole engine presently, a diesel with a traditional auto gearbox will be joining later, is a 1.5-litre turbocharged petrol engine with 161bhp and 250Nm of torque. It’s refined and smooth, 0-62mph takes 9.8 seconds in the CVT model, and 10.3 in the manual. Fuel economy is a little disappointing, 42.8mpg as a front wheel drive with a manual gearbox, while the CVT version with 4WD returns 40.4mpg. The six speed manual gearbox is excellent, however the CVT Automatic, while it has supposed fake gears to mimic a traditional Auto and the paddle shifters are lovely, put your foot down and the revs soar noisily as the gearbox resists the need for a higher ratio. Wait for the Diesel if you want an Automatic is our advice. The Manual car is front wheel drive only and the Auto can be either front or four wheel drive, Automatic prices start at £1199 AP for 2WD in trim 3 rising to £1999 AP in 4WD in trim 4.